KEY CONCEPT: Maths problems covering a range of calculations. DESCRIPTION FROM THE PUBLISHER: Did you ever wake up to one of those days where everything is a problem? You have 10 things to do, but only 30 minutes until your bus leaves. Is there enough time? You have 3 shirts and 2 pairs of pants. Can you make 1 good outfit? Then you start to wonder: Why does everything have to be such a problem? Why do 2 apples always have to be added to 5 oranges? Why do 4 kids always have to divide 12 marbles? Why can’t you just keep 10 cookies without someone taking 3 away? Why? 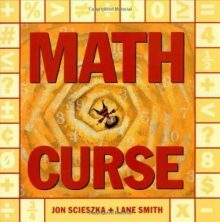 Because you’re the victim of a Math Curse. That’s why. But don’t despair. This is one girl’s story of how that curse can be broken.